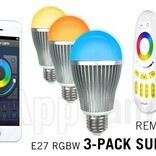 Wifi LED bulbs pack. 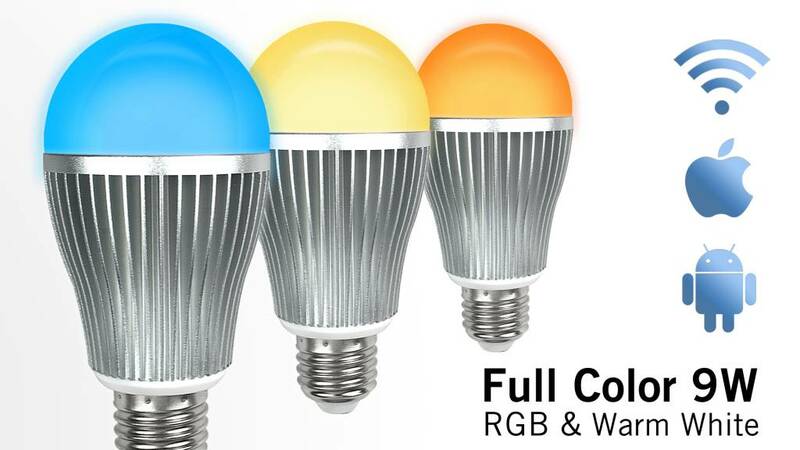 3 pcs 9 Watt Full Color RGBW LED bulbs (multi color + warm white) Included an RF remote control and Wifi Box for control via iOS or Android tablet / smartphone APP. Order now and create your own unique color scene tomorrow! 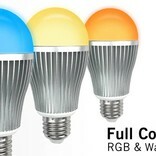 Create unique color scenes with this WiFi set with three 9 Watt WiFi LED color bulbs. 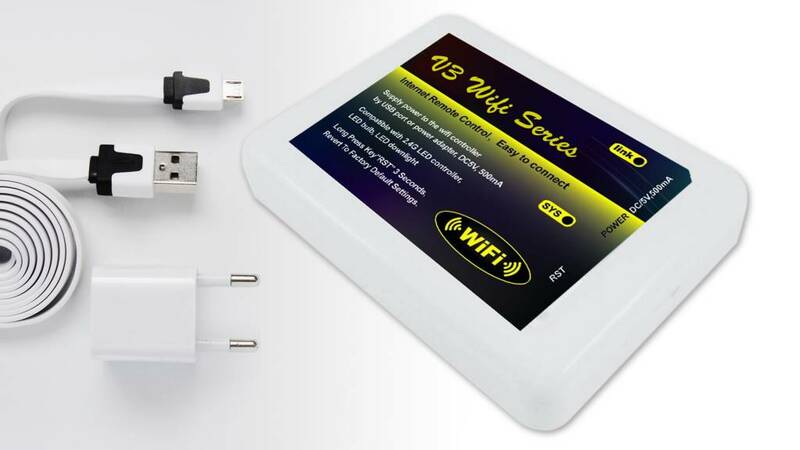 Install the Free APP, plug in the Wi-Fi box and control the bright WiFi color lights on your tablet or smartphone . Throughout the house you can wirelessly control all AppLamps with the WiFi APP. 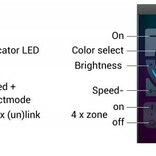 Switch on/off, dimming, choose any color or a festive effect program. The LED lamps are powerful and compare to a 60Watt incandescent bulb replacement with beautiful warm white light. 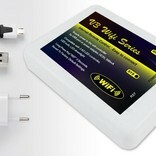 Even outdoors or on your holiday you can control the lamps in the same APP via WiFi or 3G/4G mobile internet! The APP has 8 unique groups to which you can assign an unlimited number of AppLamps. Then you can adjust all the lights to desired color and brightness . 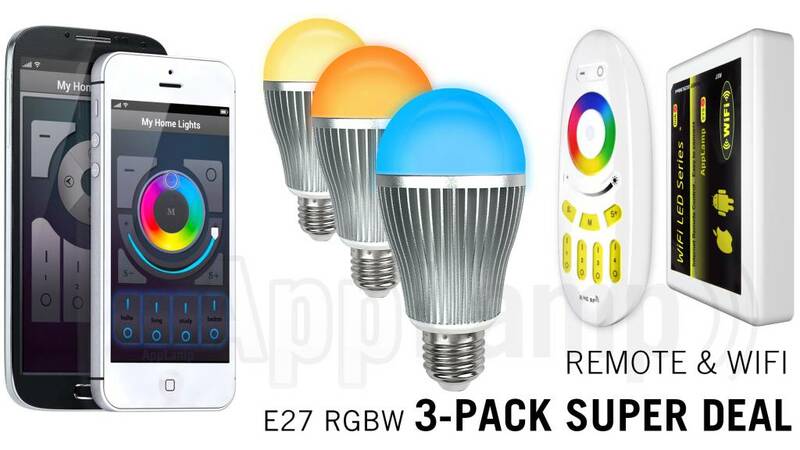 The package consists of three 9 Watt WiFi LED lamps, RF remote controlthe, Wifi Box and the free app for Android and iOS phones and tablets is available .